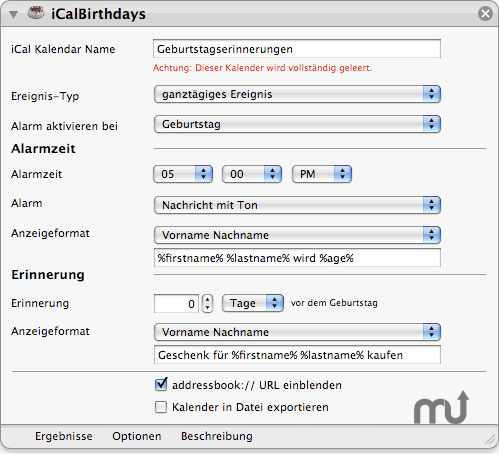 Create a birthday calendar in iCal from contacts in Address Book. Is there a better alternative to iCalBirthdays? Is iCalBirthdays really the best app in Personal Info Managers category? Will iCalBirthdays work good on macOS 10.13.4? iCalBirthdays creates a birthday calendar in iCal from the contacts in Address Book. Unlike the built-in birthday calendar in iCal, this action allows you to set an alarm for each birthday. You can also combine this action with other actions to publish your ICS file to a Web or file server. This release features several bug fixes. iCalBirthdays needs a rating. Be the first to rate this app and get the discussion started!